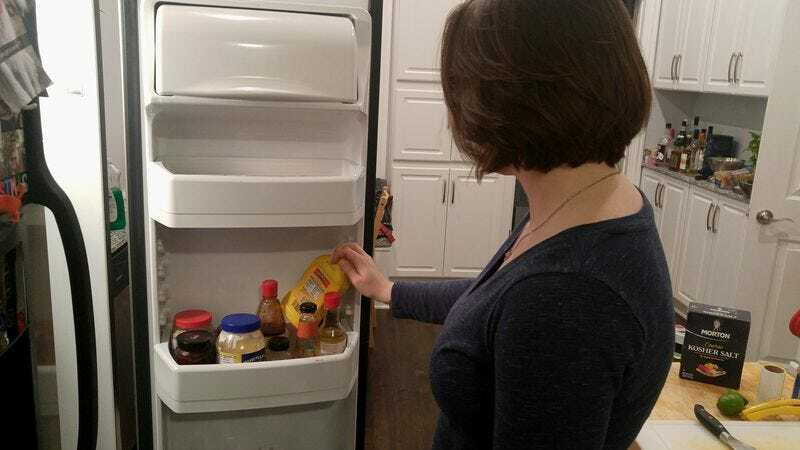 SANTA CRUZ, CA—Carefully inspecting the rows in hopes of deciphering the right configuration among thousands, local woman Mary Molatino was reportedly rearranging the condiments in her refrigerator door Friday like she was working on a puzzle in an ancient tomb. The 26-year-old, as if sorting glyphs to reveal the mysterious pattern that would unlock a pharaoh’s burial chamber, began by twisting a bottle of salad dressing edgewise and sliding it against the light mayonnaise, a maneuver that left room for the newly purchased jar of cornichons and, if her hunch was correct, the Sriracha sauce. According to sources, Molatino then paused to consider the difficult task that still lay before her, in the manner of a seasoned archaeologist keenly aware that the crypt of a king would not easily yield to the desecration of a trespasser. Leaving the large butter dish undisturbed as though it were a chalice honoring the sun god Ra that could trigger a booby trap if tampered with, Molatino swapped a squeeze bottle of ketchup with a container of almond milk, at which point it dawned on her that everything would fit into place if she slightly tilted the wine bottle, stacked the jam jars, and then delicately wedged the olive jar between the Vitamin Waters and the edge of the shelf. At press time, brimming with the satisfaction one might have at being the first to solve a 5,000-year-old riddle, Molatino suddenly heard an unearthly rumble from the ice machine.